(Uncanny X-Men I#261 (fb) - BTS) - The SHIELD agents who would become known as the Harriers decided to strike out on their own as soldiers of fortune after the spy organization fell apart following the Deltite conspiracy (see comments). They were led by Hardcase (Harry Malone), a retired British Royal Marine commando. (Wolverine II#5 (fb) - BTS) - Hardcase thought so highly of his team of non-superpowered specialists, he felt their training and equipment could even match the Avengers. (Uncanny X-Men I#261 (fb) - BTS) - The Harriers were hired by the American Drug Enforcement Administration (D.E.A.) for an undercover mission to General Coy's opium plantation in the Golden Triangle. 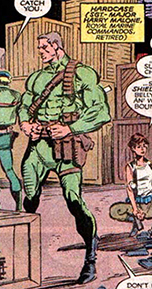 Hardcase, Battleaxe and Shotgun hired themselves out as muscle, seemingly to protect Coy's Mekon river delta drug operation during the ongoing turf war between the general and Madripoor's crimeboss Tyger Tiger. In reality, the D.E.A. would pay them handsomely if they took it down. (Wolverine II#5 (fb) - BTS) - Hardcase sent Battleaxe and Shotgun to investigate a nearby plane crash (downed by Tyger Tiger's ally Wolverine who, as Patch, had come to destroy Coy's opium harvest). Though they were prepared and careful in their approach, the duo was no match for Patch who easily defeated them. Adding insult to injury, he took their clothes and tied them up, promising them they'd lose more than that the next time. The two still managed to send an emergency signal to Hardcase at base camp, who sent out some local troops to gather the thoroughly embarrassed Harriers. Not too long after that, Coy's compound was attacked by Patch and his friend, pilot Archie Corrigan who carpet bombed the plantation, effectively destroying the entire operation. Hardcase and the Harriers escaped the bombardment unscathed and watched impressed how Patch shook off getting shot multiple times by Coy's head of operations. In the aftermath, the Harriers only found the man's head, which led them to conclude their pint-sized assailant had somehow survived. They hoped to meet him again some day. (Uncanny X-Men I#261 (fb) - BTS) - The D.E.A. refused to pay Hardcase and the others, since they were not the ones responsible for destroying Coy's opium crops. (Uncanny X-Men I#261 (fb) - BTS) - The Harriers moved to Madripoor where they set up shop in an abandoned warehouse in Lowtown, though there wasn't that much demand for their services. 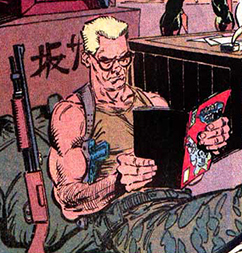 To pass the time, Shotgun caught up on his reading while Timebomb booby-trapped most of the warehouse. During this period, Hardcase ran into "Patch" again, who happened to be in town with his new allies Psylocke and Jubilee. The two old soldiers decided to test both their team's combat readiness by sending the Harriers out to capture Wolverine and the others. (Uncanny X-Men I#261) - Unaware of the true nature of their mission, the Harriers went to work even though Hardcase had to remind the vengeful Battleaxe of the fact Wolverine needed to be brought in alive. 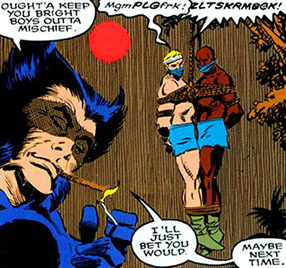 After studying the files on their three targets, they tracked them down to a local bar, where Battleaxe and Shotgun "kidnapped" Wolverine with surprising ease. They took him to their warehouse and chained him up in a cage, leaving Jubilee and Psylocke to devise a rescue plan to deal with the Harriers. After Psylocke located the Harriers' hideout Jubilee disguised herself as a pizza delivery boy and talked her way inside carrying a stack of pizzas. While she kept the Harriers occupied, Psylocke quietly snuck in from the roof. Hardcase was furious at his team's security slip up, allowing a civilian inside a secure area. He ordered "the boy's" immediate removal, prompting Jubilee to reveal her true identity. She attacked and blinded most of the team with her "fireworks". The nimble Jubilee then used the many crates in the warehouse to inadvertently evade the Harriers, even succeeding in breaking Wolverine out of his cage and further embarrassing Battleaxe by burning his behind with an especially hot sparkle. During the battle, Psylocke fought Blindside, whose thoughts proved too slippery for the telepath to control and Timebomb, who used his timed explosions to keep Braddock off balance. 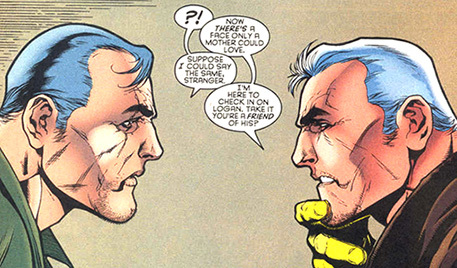 The fighting stopped when Hardcase and Wolverine revealed what was really going on, surprising both sides. A little later, both groups were bonding, sharing a laugh and some of the pizza Jubilee had brought. Their celebration was interrupted by Rose Wu and her "Wolverine Rescue Squad", consisting of Madripoor friends and allies like Jessica Drew and Lindsay McCabe. Wolverine offered them to join them in their pizza party. 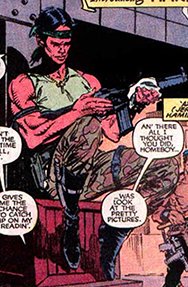 (Wolverine II#139 (fb) - BTS) - Hardcase opened up a bar in New York City as a front, from here he would send mercenaries (most likely the Harriers) out on missions for whoever's willing to pick up the tab. But while Hardcase worked behind the counter himself he began to enjoy life much more. Blindside would come and goes as she pleased, mostly working solo. Warhawk and Lifeline (Deacon) got married and moved to Bermuda and Timebomb got into a bigger spot than he could handle. (Wolverine II#133 - BTS) - Wolverine and Warbird (Carol Danvers) visited Hardcase's bar for a night of pool and drinking. (Wolverine II#139 (fb) - BTS) - In Madripoor, the Harriers were hired to track down a man responsible for creating several monsters that had been linked to dozens of worldwide disappearances and killings. Hardcase dispatched Longbow and several unidentified mercenaries to engage their target. But when the monsters creator discovered the Harriers were on his trail, he sent one of the creatures to deal with them. 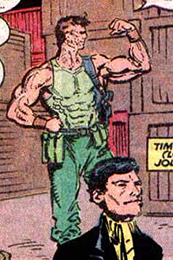 (Wolverine II#139) - Hardcase was visited in his bar by Wolverine who had come to catch up with his old friend. While they were reminiscing about the old times, Cable walked in, looking for Wolverine. Everyone was shocked when the Harrier Longbow suddenly came crashing through the window. The heavily injured mercenary had lost consciousness. 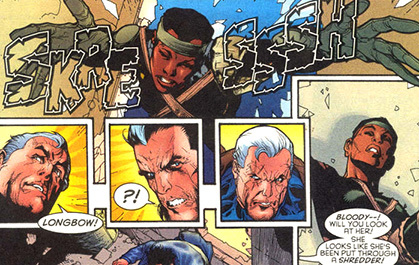 While Hardcase took care of her, Wolverine and Cable went out to find whoever attacked her. They quickly located and battled "Slappy the Lobster Boy" (as Logan called him) before the creature managed to escaped by chopper. The heroes returned to the bar to check on Longbow. 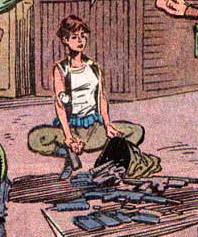 After she came to, she revealed the Harriers' recent Madripoor mission and pleaded for Wolverine's help. Teaming up, Wolverine and Cable eventually discovered the monster maker was Arnim Zola, the bio-fanatic. (Civil War: Battle Damage Report#1 - BTS) - Of all the Harriers, only Blindside was considered a potential recruit for the Initiative. Comments: Created by Chris Claremont (writer), John Buscema (pencils), Al Williamson (inks). The Harriers might well be the first case of Claremont introducing a complete team of new characters without any proper setup or pay off. He "simply" puts them out there, offering up their names and only the vaguest description of their abilities before abandoning them entirely. Claremont didn't even get around to establish the entire team's powers or abilities. One can guess what Longbow or Timebomb's skills are and Warhawk's wings are pretty self-explanatory as well, but the skill sets of Lifeline and Piston remain a mystery. The same would happen a few years later with such illustrious teams as the Neo, the Goth, the Crimson Pirates, the Shockwave Riders and pretty much everyone appearing in Storm: The Arena. Uncanny X-Men I#261 credits Chris Claremont and Marc Silvestri as the co-creators of Hardcase and the Harriers, even though Hardcase, Battleaxe and Shotgun first appeared over a year earlier in March, 1989's Wolverine II#5, written by Claremont and (first) drawn by John Buscema. In that issue, Hardcase briefly mentions the existence of the Harriers, hinting at the larger team. The final fate of the Harriers remains unrevealed. Only Blindside was considered Initiative material, which might have to do with the fact she was seemingly the only one who possessed superhuman abilities. 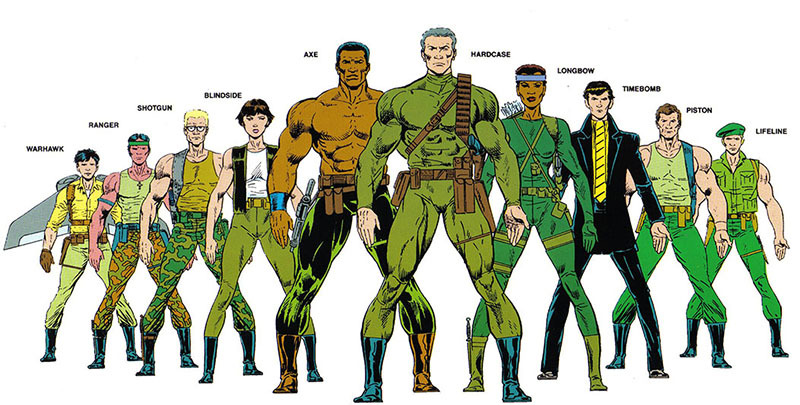 The Harriers quit being SHIELD agents after the events of Nick Fury vs. SHIELD from 1988. 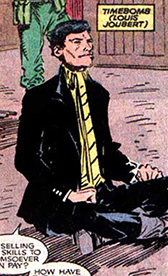 The Harriers received a profile in the Official Handbook of the Marvel Universe: Master Edition#32. (Uncanny X-Men I#261 (fb) - BTS) - The Harriers were led by Harry Malone, a retired British Royal Marine commando. (Uncanny X-Men I#261 (fb) - BTS) - The Harriers were hired by the American Drug Enforcement Administration (D.E.A.) for an undercover mission to General Coy's opium plantation in the Golden Triangle. Hardcase, Battleaxe and Shotgun hired themselves out as muscle, seemingly to protect Coy's Mekon river delta drug operation. (Wolverine II#5) - Hardcase sent Battleaxe and Shotgun to investigate a nearby plane crash (downed by Tyger Tiger's ally Wolverine who, as Patch, had come to destroy Coy's opium harvest). Though they were prepared and careful in their approach, the duo was no match for Patch who easily defeated them. The two still managed to send an emergency signal to Hardcase at base camp, who sent out some local troops to gather the thoroughly embarrassed Harriers. Not too long after that, Coy's compound was attacked by Patch and his friend, pilot Archie Corrigan who carpet bombed the plantation, effectively destroying the entire operation. Hardcase and the Harriers escaped the bombardment unscathed and watched impressed how Patch shook off getting shot multiple times by Coy's head of operations. In the aftermath, the Harriers only found the man's head, which led them to conclude their pint-sized assailant had somehow survived. They hoped to meet him again some day. (Uncanny X-Men I#261 (fb) - BTS) - Hardcase and the Harriers moved to Madripoor where they set up shop in an abandoned warehouse in Lowtown. 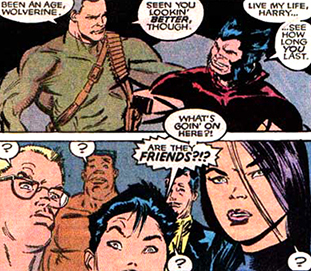 Hardcase ran into "Patch" again, who happened to be in town with his new allies Psylocke and Jubilee. The two old soldiers decided to test both their team's combat readiness by sending the Harriers out to capture Wolverine and the X-Men to save him. (Uncanny X-Men I#261) - During the X-Men's assault Hardcase played along as his teammates fought Psylocke and Jubilee until he and Wolverine revealed what was really going on, surprising both sides. A little later, both groups were bonding, sharing a laugh and some of the pizza Jubilee had brought. (Wolverine II#139 (fb) - BTS) - Hardcase opened up a bar in New York City as a front, from here he would send mercenaries (most likely the Harriers) out on missions for whoever's willing to pick up the tab. But while Hardcase worked behind the counter himself he began to enjoy life much more. (Wolverine II#139 (fb) - BTS) - In Madripoor, the Harriers were hired to track down a man responsible for creating several monsters that had been linked to dozens of worldwide disappearances and killings. Hardcase dispatched Longbow and several unidentified mercenaries to engage their target. Comments: Harry most likely earned his codename Hardcase because of his tough as nails demeanor, both in the field and in his handling of the Harriers. (Uncanny X-Men I#261) - During the X-Men's assault Battleaxe, Shotgun and Lifeline tried to capture Jubilee but the young mutant set his pants on fire. As Axe ran away Shotgun followed him with a bucket of water. Not much later the fighting stopped when Hardcase and Wolverine revealed what was really going on, surprising both sides. A little later, both groups were bonding, sharing a laugh and some of the pizza Jubilee had brought. Comments: Jerome's speciality was wielding axes. (Uncanny X-Men I#261) - During the X-Men's assault Bobbi sensed Psylocke's presence from the rafters and attacked her. Psylocke noticed Bobbi's thoughts were like quicksilver, almost impossible to lock in on them. While fighting her Bobbi recognized Psylocke's fighting style as that of a master assassin of the Hand but was than tricked into fighting a telepathic illusion until Timebomb used an explosion to get Psylocke out of the rafters. 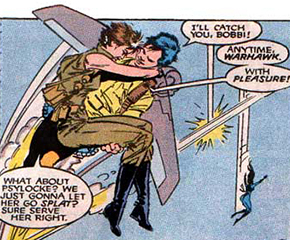 Warhawk rescued Bobbi from a deadly fall, not much later the fighting stopped when Hardcase and Wolverine revealed what was really going on, surprising both sides. A little later, both groups were bonding, sharing a laugh and some of the pizza Jubilee had brought. (Wolverine II#139 (fb) - BTS) - Blindside would keep in touch with Hardcase (who had opened his own bar as a front to resume mercenary work) but came and goes as she pleased, mostly working solo. Comments: Bobbi seemed to be the only member of the Harriers with superhuman abilities, keeping this in mind it's possible Bobbi was previously part of the psi-division of SHIELD. This is where she could have been trained to become untraceable for other telepaths. (Uncanny X-Men I#261) - During the X-Men's assault Lifeline, Shotgun and Battleaxe tried to capture Jubilee and witnessed how she put Battleaxe's pants on fire. Not much later the fighting stopped when Hardcase and Wolverine revealed what was really going on, surprising both sides. A little later, both groups were bonding, sharing a laugh and some of the pizza Jubilee had brought. (Wolverine II#139 (fb) - BTS) - Warhawk and Deacon got married and moved to Bermuda. Comments: Lifeline's speciality has not been revealed, though given his codename he might have been the Harrier's resident medic. (Uncanny X-Men I#261) - Prior to Psylocke and Jubilee's rescue attempt of Wolverine, Greer was the first to spot there was something wrong with the pizza delivery boy the others had let into the base. She shot an arrow through the pizza boxes which led to Jubilee's reveal. Not much later the fighting stopped when Hardcase and Wolverine revealed what was really going on, surprising both sides. A little later, both groups were bonding, sharing a laugh and some of the pizza Jubilee had brought. 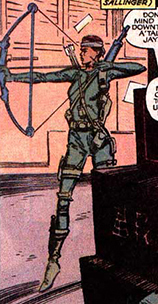 Comments: Longbow's speciality was archery. (Uncanny X-Men I#261) - During the X-Men's assault Piston, joined the other men in trying to capture Jubilee and witnessed how she put Battleaxe's pants on fire. Not much later the fighting stopped when Hardcase and Wolverine revealed what was really going on, surprising both sides. A little later, both groups were bonding, sharing a laugh and some of the pizza Jubilee had brought. Comments: Piston's speciality has not been revealed, though given his codename and the well developed muscles in his arms, he might be able to land crushing blows. (Uncanny X-Men I#261) - During the X-Men's assault Ranger sprang into action after Timebomb had blown Psylocke from the rafters, holding her at gunpoint after she landed on the ground. Not much later the fighting stopped when Hardcase and Wolverine revealed what was really going on, surprising both sides. A little later, both groups were bonding, sharing a laugh and some of the pizza Jubilee had brought. Comments: It's been unrevealed what Ranger's talents would entail. Jesus could possibly have been born in Chile, as the Rangers are a "famous" soccer team from Chile. (Uncanny X-Men I#261) - During the X-Men's assault Shotgun, Battleaxe and Lifeline tried to capture Jubilee and witnessed how she put Battleaxe's pants on fire. As Axe ran away Shotgun followed him with a bucket of water. Not much later the fighting stopped when Hardcase and Wolverine revealed what was really going on, surprising both sides. A little later, both groups were bonding, sharing a laugh and some of the pizza Jubilee had brought. Comments: Zeke's talent was wieling his shotgun. (Uncanny X-Men I#261) - During the X-Men's assault Timebomb tried to rescue his teammate Blindside from Psylocke by blowing them both out of the rafters, knowing Warhawk would catch her. Not much later the fighting stopped when Hardcase and Wolverine revealed what was really going on, surprising both sides. A little later, both groups were bonding, sharing a laugh and some of the pizza Jubilee had brought. (Wolverine II#139 (fb) - BTS) - Timebomb got into a bigger spot than he could handle. Comments: Timebomb was the Harrier's resident explosive expert, taking great pleasure at making things explode. Joubert was Franch as revealed in Marvel Atlas' France entry. He was designed to resemble a typical Parisian. It even looked like he had a pencil moustache. (Uncanny X-Men I#261) - While fighting Psylocke and Jubilee, Warhawk sprang into action to save Blindside who'd been blown off the rafters by one of Timebomb's explosives. Not much later the fighting stopped when Hardcase and Wolverine revealed what was really going on, surprising both sides. A little later, both groups were bonding, sharing a laugh and some of the pizza Jubilee had brought. Comments: As the Harrier's resident flight expert, Warhawk wore a personalized rocketpack strapped to his back that allowed him great aerial manoeuverability. The pack had sufficient thrust to carry both Warhawk and at least one passenger.